This is the guide for the ultimate experience for any Arena Racing fan. We'll provide you with the exclusive tips on how to get the most out of your race day experience from what to bring, to where to park to how to get an up close and personal with the drivers. So here's what you need to know after you've purchased your tickets! It only takes a minute and it's very easy to enroll into the Arena Racing VIP Club. The features and benefits offered to Club Members were designed specifically to enhance your race day experience. It all starts with exclusive Reserved seating in our VIP Section, located directly across the arena from the Start/Finish line. You'll also have exclusive and unlimited access to our VIP Club Lounge, where you can enjoy some privacy away from the race day activities. The VIP Club offers a variety of beverages and food options, a television, comfortable booths and bar stools...it's like having your own private sports bar! Your VIP Club Membership also comes with an All Access Pit Pass which will give you a behind-the-scenes experience that only Club members will be able to enjoy. In addition, VIP Club Members receive insider access to special events, team and driver news, advance notification of upcoming races and exclusive season ticket offers. Camera - you'll want to capture all of the excitement including the cars, the track, the crowd, family & friends, and the drivers! Sharpie - you'll be able to get autographs from all of your favorite drivers, during the Driver Meet & Greet, which starts an hour before each race. Two things you won't need are binoculars and ear plugs. There's not a bad seat in the house at the Richmond Coliseum so you're really close to the action. And because Arena Racing Cars aren't as noisy as other gas engine stock cars, you can actually hear the person next to you. The Coliseum doors don't open until an hour before the first race, so if you're looking for things to do in Richmond prior to the event, check out the Richmond Family Magazine site for family-friendly activities. Just click on the RFM logo and explore. Speaking of family-friendly, G-Force Karts will get your family's 'race juices' flowing with their 1/4 mile indoor go kart racetrack with exciting twists and turns, allowing drivers to use their skills to outmaneuver their competitors. Click on the logo for a special offer only for Arena Racing fans. When purchasing your tickets online or by phone (groups), you can pick up them up at the Will Call window located at the 7th Street Entrance. Just walk in the door and you'll see the Arena Racing Will Call table to your right. Please be prepared to provide a photo identification. VIP tickets, or tickets left by a third party, may also be picked up at Will Call, which opens one hour prior to race time. Day races start at 3:00 p.m. and Night races start at 7:00 p.m., so be sure to confirm race start times at time of purchase. There isn't a bad seat in the house as the Richmond Coliseum offers excellent sightlines no matter where you sit. However there are some great options depending on your preference. If you like the action at the beginning and end of races, then the Start/Finish line is the place for you. You'll also be closer to our Re-Start zone which always gets a lot of amazing action. Another great option is a seat in one of the four corners of the arena. Race fans know that the corners provide a 'wide-lens' view so you can take in all of the incredible action at once! Last but certainly not least, race fans everywhere enjoy wider and more comfortable seats. Our VIP Section, located directly across the arena from the Start/Finish line, not only provides a more comfortable option, but you'll also be closer to the VIP Club Lounge. The Lounge is actually built into our VIP Section so quenching your thirst and your appetite is quick and easy. The other invaluable perk is that the Lounge has its own private facilities so you don't have to wait in lines with the crowd. So join the VIP Club before you come to the arena and enjoy all the features and benefits that membership has to offer! Luxury Suite packages start as low as $450 for an entire night of Arena Racing for you and your guests. For information about how you can become one of the select few to have this opportunity, please call Lesa Williams, lwilliams@smgrichmond.com 804-780-4970 ext 114. Please contact Event Coordinator or mworsley@smgrichmond.com for menu options and to place an order. The ultimate experience for any race fan, the Driver Meet & Greet, gives you an exclusive look at the Arena Racing Cars, autograph and picture opportunities with the drivers, merchandise give-aways, contests and more! The Meet & Greet is held on the infield of the track so make sure you get there an hour before the race starts to get the most out of this special experience. And to entertain you throughout the event will be our in-house DJ, spinning all of your favorite tunes! Don't miss out on your chance to experience the Arena Racing Opening Ceremonies, which feature the reciting of the Pledge of Allegiance, the singing of our National Anthem by talented vocalists, and the tradition and pageantry of driver introductions. Since Arena Racing USA is the Premier Stock Car Developmental League®, fans are treated to watch some of the brightest, rising stars of the stock car world. Each event consists of a minimum of 4 races; two Pro Division qualifying races (A-Main, B-Main), a Future Stars race with our 8-13 year old drivers) and the Top Dog Finale, which features the top 14 qualifiers of the Pro Division races. Each race is only 50 laps and the cars speed around the track in about 8 seconds, so the action is fast-paced and action-packed. Fans should try and focus their attention on the turns and how the drivers successfully (and unsuccessfully) pass each other. Due to the size of the track, this is a learned skill that these drivers try and perfect before they head outside on the larger tracks. And if the drivers are involved in a wreck, they must restart at the back of the pack, so their passing skills are paramount to allow them to get back into the race. Make sure you take home a souvenir from the race by stopping by the merchandise booth located in the concourse. But if you don't want to miss any of the action, souvenir vendors make their way through the crowd throughout the race so you never have to leave your seat. The Richmond Coliseum offers many delicious menu items throughout the concourse when it comes to arena food, but if you're looking for other options, Papa John's and Johnny Rockets both have booths on the concourse as well. If you're looking for more of a sports bar atmosphere, take a stroll over to Section 17L and visit our VIP Club Lounge! Enjoy the Pit Stop $5 Value Menu while sitting down in one of the comfortable booths or just belly right up to the bar! The featured event of the evening is the Pro Division Top Dog race where the top qualifiers battle each other for the evening's trophy and cash prize. The Top Dog race is the one, must-see event of the evening so don't wander too far from your seat after the Future Stars race. These drivers are the best that Arena Racing has to offer so it's like watching an all-star game every night!! Ever wonder how banged up stock cars get during a race? Wonder no more. All fans are invited to stick around after the Top Dog Race to come down to the infield for the Post-Race After Party and take a look at the bumps and bruises each one of the cars received during the night of racing. Once again, you'll be able to get up close and personal with our drivers...take pictures and get autographs with your favorites and it's your opportunity to ask them questions about anything you'd like to know. This is a perfect way to end your amazing evening of Arena Racing. If you attend the Post-Race After Party and stay until the end, most of the traffic will have already cleared out, so getting out of the parking lot and back on the road will be easy! 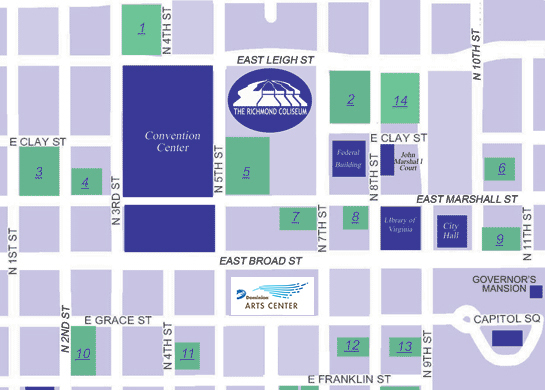 The Richmond Coliseum is conveniently located off of I-64 and I-95 in downtown Richmond at 601 East Leigh Street. There are many different ways you can get to the Coliseum so use this link to find the best way for you. Parking lots and garages surround the Richmond Coliseum from every direction! On this map you will see that public parking areas are marked in green. If you're coming from out of town and want to spend the night or the weekend, VisitRichmondVA.com can help you plan your trip and find the best places to stay.